I very much remember this story. 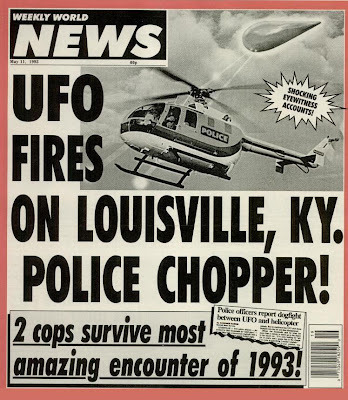 In fact, the Weekly World News tabloid ran it as a front page cover story some months after it took place (it would be awesome to find a copy of it). 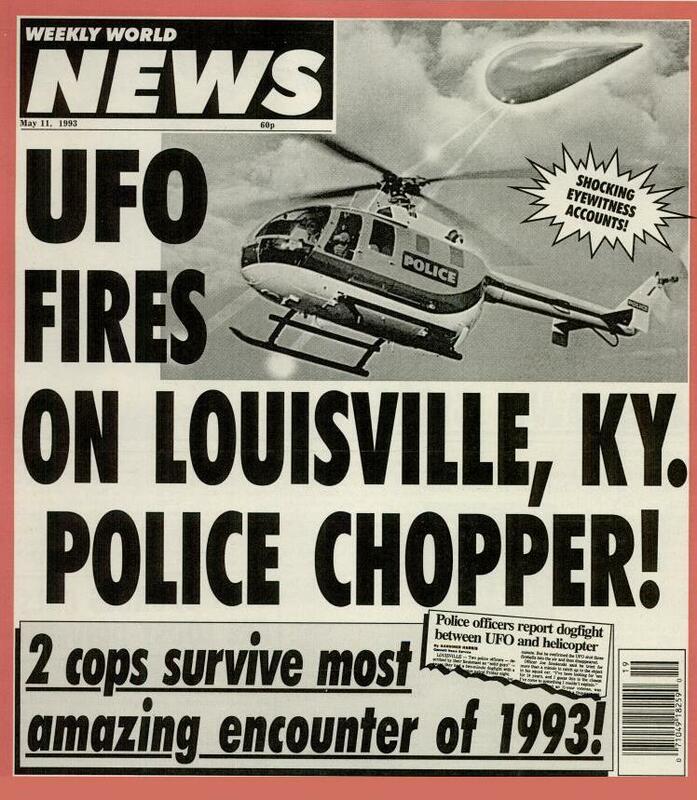 The Weekly World News story distorted everything a bit and claimed a massive dog fight over the skies of Louisville. Their version of the story was awesome. However......the real story came out a few days later when a guy stepped forward and told how we was showing his wife how to make miniature home made hot air balloons (I.e., chinese lanterns). Apparently he had made these in the Boy Scouts as a child and thought it'd be fun to make another. He launched the balloon about the time a police chopper was near. As the chopper approached the balloon, the wind from the rotors would push the balloon away. The fireballs were supposedly melting plastic. Interesting, to say the least. I'd be curious to know what the cops themselves thought of this revelation, and if they still stuck to their story. 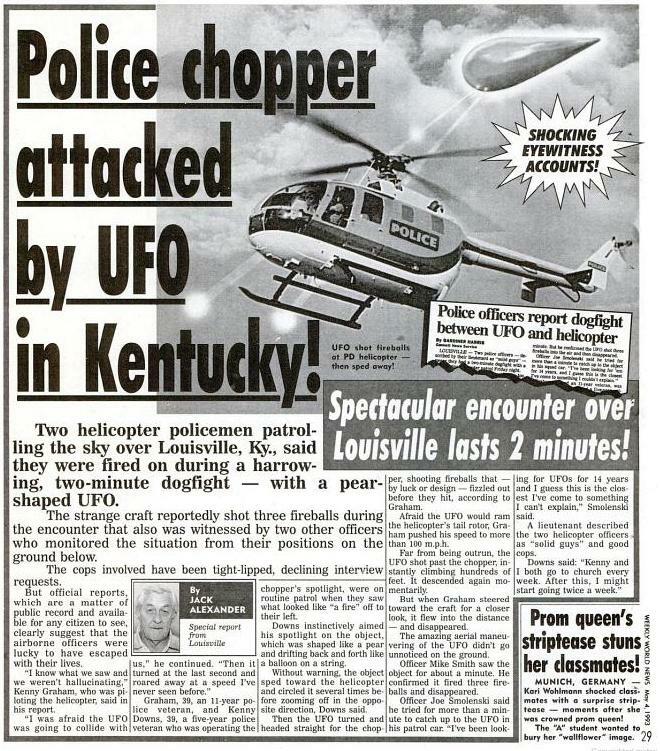 The original report claimed the object "literally flew circles around the helicopter, even though the fliers say they were moving at speeds approaching 100 mph", and that doesn't really sound consistent with balloon behavior. The bit about the fireballs being shot out from the main object being "melting plastic", I don't know. 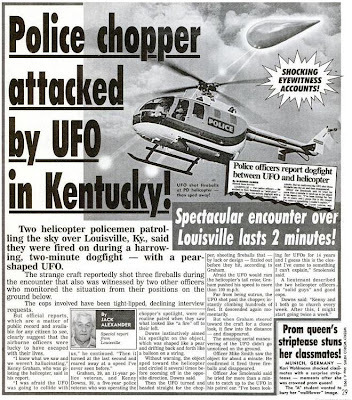 It all sounds a bit specious, but on the other hand, the idea of a basketball-sized UFO sounds pretty unlikely as well.